Today we have another guest post about the Gotham Ghostwriters holiday gathering, this one by David Alm, writer, ghostwriter, reporter, editor, and professor of media studies and cultural criticism at Hunter and NYU, respectively. This article was originally published on Contrary Magazine, where David is one of the primary writers. 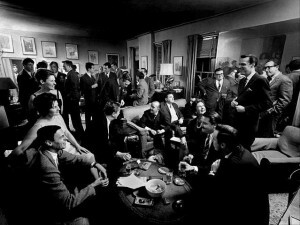 A gathering at George Plimpton's apartment in 1963. I had no idea what to expect. A holiday party for ghostwriters sounds like scene in a Woody Allen movie from the late 80s. A bunch of disgruntled, hyper-cerebral guys in well-worn corduroy jackets sipping G&Ts and swapping stories about dropping acid with Cary Grant or Henry Kissinger’s bathroom habits. So as I made my way to the Gotham Ghostwriters holiday party last night, I braced myself for the unexpected. I also wondered what kind of literary life might still exist in the shadows of New York City, which has rapidly become so transformed by high finance that it bears almost no resemblance to the grimy artistic mecca that provided the foundation for Woody Allen’s fictions. Had the shabby-chic literati of yesteryear been expelled from Manhattan along with the independent bookstores and cafés? From what I saw last night, no. They’re still here, still writing, still swapping stories, and still wearing corduroy jackets. (At least some of them are.) There are women, too, of course, and they don’t all look like Susan Sontag—that is, severe, intense, poised to challenge your every word. And they’re still lively, cerebral, and full of self-deprecating wit. I spoke with a man who’s ghosted 43 titles, including a memoir about the Rwandan genocide, and who began his literary career as a songwriter. I spoke with another who’d spent years reporting for American newspapers in Cambodia and Thailand. I spoke with a young guy from London who used to write about foreign policy for the Wall Street Journal. Everyone, in his or her own way, was fascinating. Ghostwriting is solitary, often thankless work. You can toil away for months to capture a client’s “voice.” In the end, you might get a decent paycheck, but more likely you’ll make a piddling sum compared to what your client earns for your efforts. And rarely do you ever meet other “ghosts.” I have ghostwritten only two books, for the same client, and in the 10 years since I wrote the first one I have never met another ghostwriter. You put a few dozen of us in a room together, and it’s instant community. Indeed, last night felt like a reunion, though everyone there was a stranger. So, as yet another corner coffee shop is replaced with a Starbucks, another East Village walk-up is gut-renovated and parceled out in $2-million pieces, and another glass-and-steel monstrosity rises along the West Side Highway, it’s nice to know that people are still gathering in little bars to talk about writing. Even if no one will ever know our names. Great piece, David. Sounds like the holiday party was a huge success.